What is the right floor system for us? So many choices, companies, claims, endorsements, and recommendations to consider. The more you look, the more confusing it gets. Here is what you need to do. Here is what you need to know to get the flooring system suited to your needs. Start with you! Answer the following questions and you will have a clear vision of what works for you and what does not. Do you rent (and how long a commitment) or do you own the space? Answering this question helps you determine whether you want a temporary, semi-permanent, or permanent installation. That will impact your choice of installation materials and who will do the installation. Is this new construction, a renovation, or a replacement/repair? What is the condition of your slab? Is it concrete or wood? Are you above or below grade? Will ceiling height be a factor with a built up flooring system? These and other conditions need to be discussed with your contractor (if you are using one) the flooring company and your installer (that could be you and your crew). If you are doing a renovation and need to demo your old floor, it needs to be completed before your installer arrives unless other arrangements have been made. Give yourself a to-do list, especially if you are going to install yourself. Review the instructions and make sure you are comfortable doing the job. Determine how much help you will need. Flooring is heavy and awkward to handle. Make sure you have the necessary tools and online or telephone support. Measure the length and width of the studio. If you do not have right angle walls, make a drawing. This is key in determining the right amount of material you will need. Note: are there any unusual structure in the space: steps, columns, vents? The flooring company should be able to help determine what you need. Determine every activity that will be going on in that space. 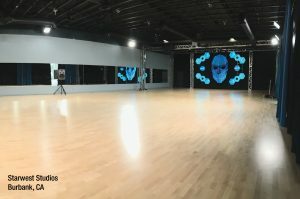 Dance floor surfaces have specific or general use capabilities. Picking the wrong floor for what you do probably means you will soon be installing a new floor. So why so many different kinds of floors? Is one better than another? What do I need to know to figure out what I need? First, there are two very different kinds of floor: wood and vinyl. If only it was that easy! Let’s start with wood. Hardwood floors usually come in maple, oak, beach, ash, etc. Stay away from pine as it is too soft for a dance floor. Solid hardwood is just that; solid all the way through and its only ingredient is wood usually ¾ of an inch thick. You will need a professional installer if you are going the hardwood route. Then there is composite wood flooring. Here a thinner layer of hardwood is attached to plywood or a similar backing. It is less expensive and lasts about 2/3 as long as hardwood. It is also less likely to be impacted by humidity and temperature change. Both options are good for studio use. Heads up! Bamboo is not a wood. It is a plant. It can not be sanded or refinished. It usually comes with a factory finish that is too slippery for most dance activities. Laminate flooring looks great; however, be very, very careful. It is a wood and vinyl combo with a factory finish (too slippery) and a very thin wear surface that can easily be scratched with no option for sanding and repair. Stay away from laminate flooring. Vinyl roll out flooring comes in three grades: residential, commercial, and industrial. Stay away from all residential vinyls. They are made from your home, not for your studio. Most dance floors fall into the range of commercial. They are more robust and can take the day to day heavy use. Vinyl floors are made in one of two ways: calendered and extruded. Calendered floors are soft and pliable. Think of the classic reversible marley type flooring. They are usually light weight, less expensive, and great for all dance styles except for percussive (tap, clogging, ballroom) dance. They make excellent touring and performance floors. If you tap, these floors are not for you. They cut easily. Extruded vinyl flooring are denser, a bit more rigid, and are the standard multi-purpose studio flooring option that most studios purchase. Some vinyl floors come cushioned backed. They reduce sound and in some cases replace the need for floating subfloors. Sound reduction makes them a less than ideal flooring for tap. Vinyl floors can also come with fiberglass linings for stability and better lie flat. There are multi-layer vinyl floors that create the look of wood. Get samples. If you can, dance on the floor you are hoping to purchase. Find out and secure the necessary maintenance supplies. Set up a maintenance program. Flooring from known dance floor suppliers are not that different from one another, but you do have to compare apples to apples. Floor thickness means almost nothing. It is wear thickness that reflects to some extent how long a floor will last. That is determined by use and maintenance practices. Get a written delivered price. Check specifications. All floors have safety data sheets which reference a number of characteristics most importantly, the floor fire rating and load bearing (weight it can handle safely). This is not only a big investment, it impacts your business. 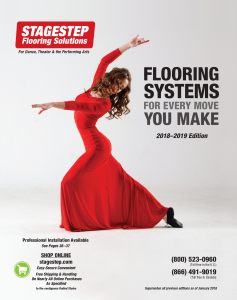 In the end, dance flooring systems are about two very important things, safety and performance for you and your students. While this blog is about floor surfaces do not forget you need to have a floating wood subfloor as well. Plan months ahead and check out all options. Compare prices, paying more only guarantees you are paying more. Deal with a dance floor supplier who has a track record and is transparent about pricing and guarantees. Flooring should be the last item to be installed in your facility. Schedule it that way. Buy material that is not actual flooring. Cut corners…gravity matters. Dancing on tile over concrete is not an option. Buy from a company that knows nothing about dance floors. Purchase from a company that will not support your post installation needs or answer questions about maintenance, reinstallation, or moving. Good luck and if you have any specific questions not referenced above, please call for a no obligation consultation.